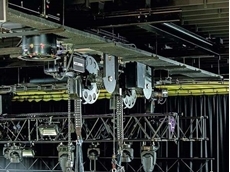 With moving energy supply systems, complicated stage applications can be implemented even in confined spaces and with high loads. Treotham introduces a new data cable from igus offering guaranteed service life and UL approval for moving applications. 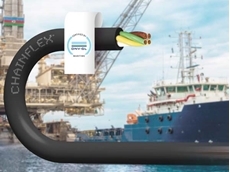 Treotham offers chainflex cables from igus designed specifically to allow safe energy and data transmission in maritime applications. Many things move in industry. What is good for production is a major challenge for cables. Energy chains are often used to protect moving machine cables and hoses from tensile and torsional forces as well as external influences such as impact or welding sparks. Even then, the demands on the cables remain enormous. An energy chain can be described as the umbilical cord of a machine. It supplies a machine part with energy, data and media whilst following its every movement. The degree of movement ranges from simple linear strokes to six-axis robotic applications. For the cables to withstand stresses millions of times without core breaks or the ‘corkscrew’ effect after a few thousand cycles, the material and structure of the cable must be perfectly matched to each other. Experience shows that even highly flexible cables in dynamic use in energy chains often quickly reach their stress limits. Can their service life be predicted? The standard tests performed by VDE, IEC or UL don’t offer a clear statement, because only a long-term test in the energy chain itself offers this. Relevant standards use other means that merely simulate the wear regardless of the chain or the chain material, again offering little accuracy for cable lifetime in energy chains. 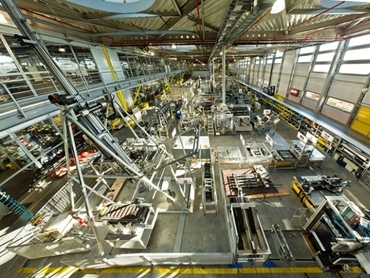 To be able to predict the service life reliably, the company igus, as a specialist in plastics and cables in motion, operates the largest test lab for cables moving in energy chains in the industry (1,750 square metres). Here, products are tested for their resilience in continuous operation in 58 different test rigs. Since the exact reproduction of the real working conditions is crucial, test axes are available with different travel distances and accelerations or environmental conditions. For testing large energy chain systems, such as those used in crane facilities, an outdoor test site with a travel distance of up to 240 metres is available. Here components have been successfully tested at 4 m/s and with an additional load of 8 kg/m for a total lifetime of 25,000 km. Likewise, temperature conditions from -40°C to + 60°C are tested. The specially adapted container, in which these conditions can be simulated, is of vital importance. Unlike standard ‘cold winding’ tests, in which test cables are wound up on a mandrel and cooled to test in temperature conditions just once, here the cables and chains are put under appropriate test temperatures and realistic motion conditions. They must withstand millions of strokes to prove they will withstand the expected bending stress in a real application. A test is considered passed when no jacket breaks can be detected, and thus proved to have the necessary cold flexibility. The tests are not always about extreme temperatures. 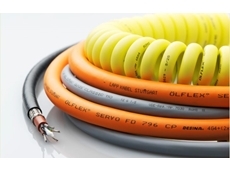 Customer requests are often about cables that must operate reliably at -5°C. Therefore, for the last four years, igus has been offering an oil-resistant PVC compound, which has a high abrasion resistance with a wide temperature bandwidth. 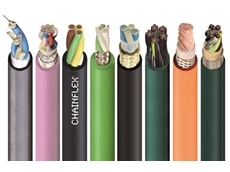 This is unique on the market, because the usual PVC compounds for chain-suitable cables do not normally meet these requirements. Another benefit is that in more moderate temperatures it is not absolutely necessary to rely on expensive jacket materials such as PUR or TPR. The findings obtained from the ongoing analysis of all tests for more than 25 years have been archived at igus and used for the development of its own, ever-growing range of cables. This has led to, among other things, the introduction of stranding in bundles, similar to the concept used in steel cables. In an elaborate bundle stranding process, the cores are stranded in individual bundles with three, four or five wires, which are then again braided with each other into an overall stranded bundle. For large stranded super structures, this is done around a strain relief element. 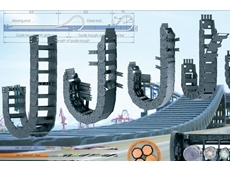 The result is a cable that is durable in motion and suitable for chains because, in contrast to a layer-stranded cable, each of the cores moves similarly in the inner and outer radius with the motion in the energy chain and thereby prevents relative stretching and compression. In even more extreme movements, cables with a similarly complex cable structure are used. The so-called ‘robot cables’ are primarily used in industrial robots and must follow very extreme movements, bends and torsions. Special damping elements give the cores the necessary freedom of movement in the interior of the cable. Because, the more twisted the cable is when approaching its load limit, the more difficult it becomes for the cable to twist. Special shields and exterior materials also ensure an optimum durability of the cables. The service life of a cable used in an energy chain will depend on a variety of variables that must be considered in the structure and the choice of materials. 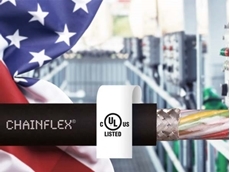 Thus the igus chainflex product family from Treotham currently offers 1,040 different cables. How long the cables last in a relevant application can even be calculated by users themselves. This is made possible by the results from the 2 billion test cycles each year in the laboratory, which is incorporated into the igus database. Based on this data, the free online tool on the igus website predicts the service life of cables. 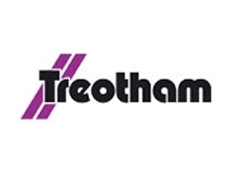 For more information on the large range of chainflex cables, speak to one of the technical engineers at Treotham Automation.